I pack lunches and we pile into the van. 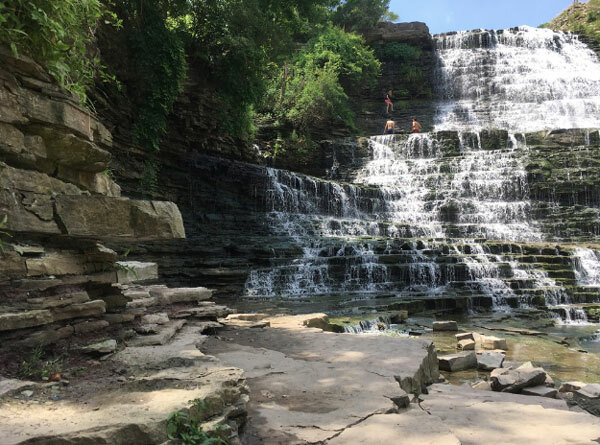 In a city with 100 waterfalls, it’s high time we visit another. Setting the GPS to Albion Falls, we leave the campground and head southeast. We pass the travel time by listening to Mr. Poppers Penguins. Twenty minutes later we arrive, exit the van and begin our hike to the falls. The sign near the trailhead warns of poison ivy. Ironically, we feel well prepared to identify and avoid the dangerous flora, thanks to our time in Connecticut. Making our way cautiously down the embankment, we meet the down-flow from the falls and begin to track it to its head. 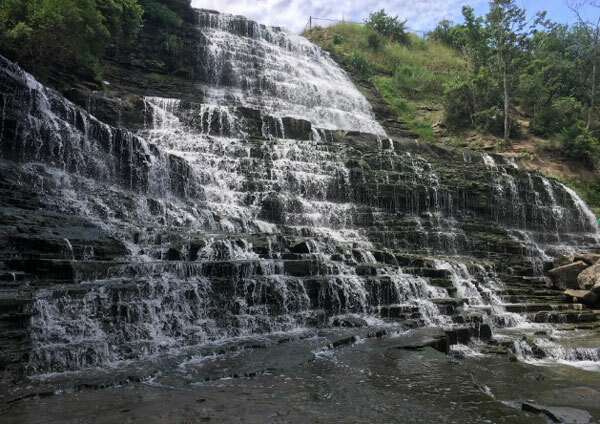 Characteristically, we hear the falls before seeing it. As we approach, stepping gingerly from one dry rock to another, it becomes immediately obvious that we are not the first ones to traverse this trail. The breathtaking chiaroscuro* filtering through the trees and refracting off the water does nothing to detract from the garbage lying about. Try as I might, I cannot not see the trash. It’s everywhere. Plastic water bottles are piled up in heaps. Empty firework casings from the recent 150-celebration float in the water, helplessly trapped behind a rock. Dirty socks and Tim Horton coffee cups are peeking out from the bushes. 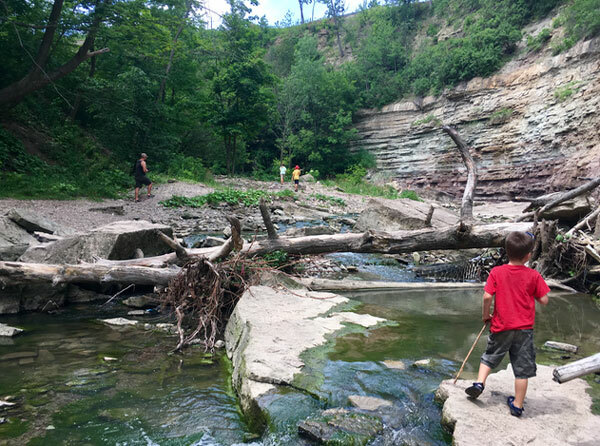 Undaunted, our kids seek out pools of water in which to peer and boulders and rocks begging to be stood upon. In my efforts to take a photo sans garbage, I succeed. Yet I know when I look at the picture in the future, my brain will auto-insert the trash that was so carefully omitted. Later that day, my mind returns to the waterfall and the trash tainting her beauty. It bothers me. I attempt to analyze the human psychology behind this phenomenon. I’m certain that no one likes the look of it. Yet, it takes the collective work of many for the problem to become so unsightly. I settle on laziness as the root of the issue. Our culture has shifted from prizing resourcefulness to convenience. In the wake of that shift we’ve fostered a feeling of entitlement toward ease. After all, who wants to carry trash when we could just set it down? Add that to a crowd mentality that says ‘if one person does it, I’ll follow suit’ and it’s easy to leave what we don’t wish to carry. While I might feel justified in my disgust, I realize that I’ve contributed to the problem. 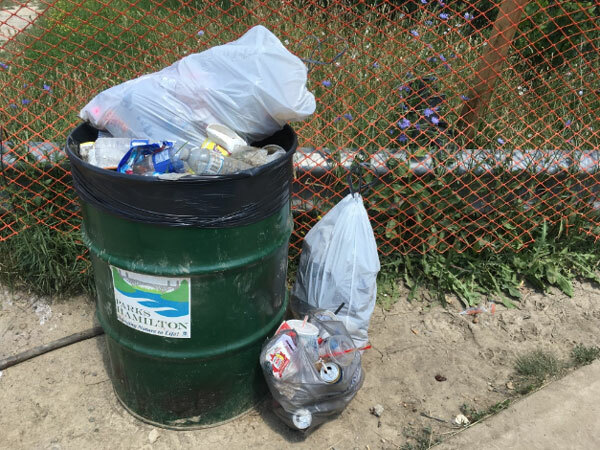 I may not have left any trash, but I saw a problem and chose to do nothing about it. This I realize, is simply another, less obvious form of laziness. Perhaps I’ve become too analytically involved. However, I can’t shake the idea that seeing a need and ignoring it is not the kind of person I want to be. 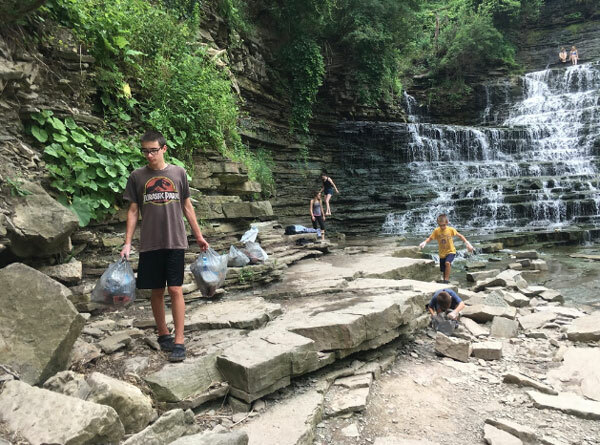 The following morning I propose an idea to Trent and together we bring it to the kids: what if we returned to the falls with the intent to clean it up? What if we brought gloves and trash bags and worked together until it was beautiful again? Not because we think it will stay that way (it won’t), but because we can. When we can leave something better than we found it, shouldn’t we? The kids agree and so once again, I pack a lunch and we pile into the van. Mr. Popper entertains and we arrive 20 minutes later, ready to work. The job is arduous, hot and at times disgusting. But feels good to be part of a transformative change. With each bag of trash that we fill, more beauty becomes visible. The kids receive encouraging accolades from passersby who are amazed that they want to do this and are humbled to learn that we were not even Canadian. When we finish, I stand and see the view that had previously been obscured. The falls in all her majesty had not changed, yet I have. I want to be the kind of person who not only sees needs, but anticipates them and is ready to respond. In the simplest of terms this could mean going on a hike with a trash bag in my pocket. In the broader scope of life, this might mean having care packages in our car ready to hand out or praying that the Lord will put someone in my path that needs help and looking for them throughout the day. It’s less about good works and more about premeditated love. It’s about recognizing that we live in a messed up world and knowing that each day we can simply walk through it or carry a trash bag with us and leave it a little better than we found it. 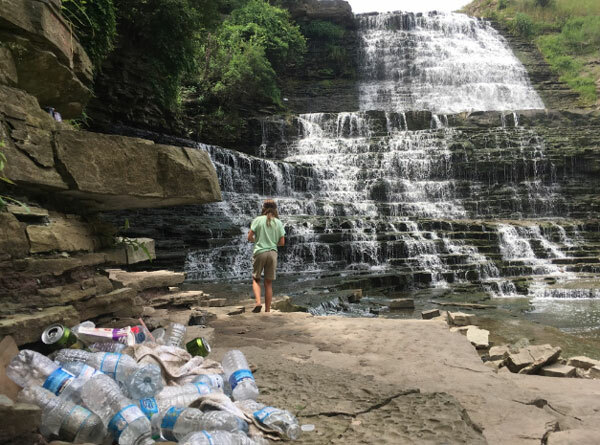 Photo details: We were thankful for this trash can at the top of the falls which we filled to overflowing as I had not thought about where we would put that trash if it had to go in our van! Chiaroscuro |kyärəˈsk(y)o͝orō| an effect of contrasted light and shadow created by light falling unevenly or from a particular direction on something: The breathtaking chiaroscuro filtering through the trees and bouncing off the water does nothing to detract from the garbage laying about. This is great! You are such an inspiration, and have inspired me to also be the change and make a difference. Thank you! XOXO I love that we can encourage each other on to love and good deeds! Wow! What a great post! Nothing makes me more crazy than litter-especially in God’s beautiful creation! I’m often found picking it up and I’ve wondered if it’s just because I’m a weird obsessive/compulsive or if it’s that Girl Scout motto engrained in me as a child to “leave a place better than you found it”! But I’m super impressed that your family took the time and effort to GO BACK and clean it up! I love the thoughts of “be the change” and “premeditated love”! Thank you for this inspirational lesson! I *love* that Girl Scout motto! To me, it is simply another way of loving God and loving others.